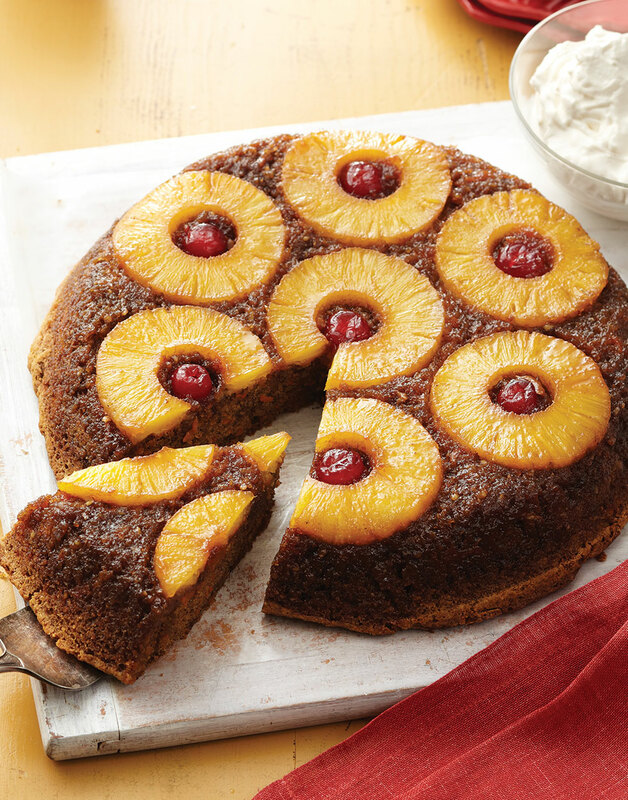 Besides being a dessert that both carrot and pineapple upside-down cake-lovers can rejoice in, this cake is easy to make. And there’s a bonus — you don’t even need to own cake pans! Your versatile cast-iron skillet will do the job. To remove excess liquid, drain the pineapple rings on layers of paper towels. Melt butter in a 10-inch cast-iron skillet over medium heat. Stir in ¾ cup brown sugar; simmer 2 minutes. Off heat, place one pineapple ring in the center of the skillet and remaining rings around edges. Place a cherry in the center of each ring. Whisk together flour, cinnamon, allspice, baking soda, baking powder, and salt. Beat granulated sugar, ½ cup brown sugar, and eggs with a mixer until thick and creamy. With the mixer running, slowly drizzle in oil, beating until combined. Stir in carrots and pecans, then stir in flour mixture until thoroughly combined. Pour batter into skillet. Bake cake until a toothpick inserted in the center comes out clean, 50–60 minutes. Let cake cool in the skillet 10 minutes, then turn out onto a serving platter. So the caramel doesn't overcook, turn off heat when adding pineapple rings to the top. Shred carrots with a box grater. Or for ease, use the shredding disc of a food processor.